THE FACT THAT 90% BUSINESSES FAIL WITHIN 18 MONTHS, MEANS THAT SUCCESS IS SOMETHING YOU HAVE TO WORK FOR AND WANT. TO ENSURE YOU SUCCEED YOU NEED TO GET THE EDGE ON YOUR COMPETITION. Over the years Kevin Green has earned a highly regarded reputation for delivering a program of training and coaching used by companies and individuals worldwide. 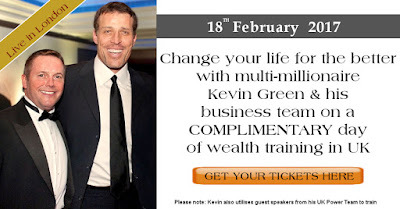 His Kevin Green Wealth Coach program is unique in that it is tailored to the purchaser. Unlike some other speakers, Kevin’s training strategies are derived from personal business successes. ONLY a few days left to register for your FREE ticket!! Click this link http://kevingreen.uk/kgw-event/ & register for your FREE ticket to learn how I went from homeless to multi-millionaire... I will be live on stage on 1st July 2017, at my one day training event in London. When you register you will receive live training, AND you will also get a FREE e-book (Written by me) AND you and your guests will get FREE entry into a prize draw to win £2500 worth of online training. Over the years Kevin Green has earned a highly regarded reputation for delivering a program of training and coaching used by companies and individuals worldwide. His Kevin Green Wealth Coach program is unique in that it is tailored to the purchaser. Unlike some other speakers, Kevin's training strategies are derived from personal business successes. See what clients of Kevin Green Wealth have to say about Kevin's LIVE training's. All these examples are asset based businesses, therefore, deemed a lot safer by analysts than investing in non asset based structures like exchange traded funds ( ETF’s), stocks and shares, forex, or any businesses whereby we don’t own or control that business. Results can vary, however, therefore, all attendees should seek independent professional legal and financial advice before investing, Kevin also reserves the right to ask one of his business partners to speak at these events should he not be able to attend. Kevin and his Kevin Green Wealth team look forward to helping you towards Wealth, Happiness and Financial Freedom. Through empowerment and implementing entrepreneurship from primary school through to adults, Kevin was very proud of his prestigious position as business and entrepreneurship advisor to Government, it fits exactly with his remit of helping people into business. 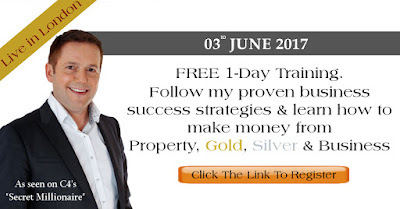 I am pleased to invite you to a complimentary KGW Property, Gold, Silver and Business Training event which will give you a valuable insight into how you can make Property or business or precious metals all work for you. Kevin's team will share his successful in-depth high profit structures giving delegates a foundation toolkit to wealth creation. Approximately 50% of the training sessions focus on property/property related businesses and 50% on other high cash flow and profitable business start-up strategies. All these examples as asset based businesses therefore deemed a lot safer by analysts than investing in non asset based structures like Exchange Traded Funds ( ETF’s), Stocks & Shares, Forex, or any businesses whereby we don’t own or control that business. Results can vary, however, therefore all attendees should seek independent professional legal & Financial advice before investing, Kevin also reserves the right to ask one of his business partners to speak at these events should he not be able to attend. 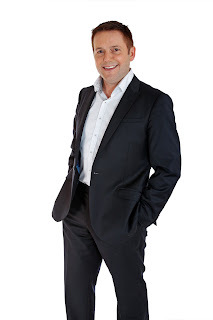 Kevin & his KGW (Kevin Green Wealth) Team look forward to helping you towards Wealth & Happiness, on empowering and implementing Entrepreneurship from primary school through to Adults, Kevin is very proud of this prestigious position as it fits exactly with his remit of helping people into business.